Given that there are ambitious plans to colonise Mars in the near future, it is surprising how much we still have to learn about what it would be like to actually live on the planet. Take the weather, for instance. We know there are wild fluctuations in Mars’s climate – and that it is very windy and at times cloudy (though too cold and dry for rainfall). But does it snow? Might settlers on Mars be able to see the red planet turn white? A new study surprisingly suggests so. Mars is clearly cold enough for snow. It has ice – the amount of which has varied significantly over time. When its axis is tilted at only a small angle relative to its orbit, its surface is ice-free except for the polar caps. This is the situation today, when its axial tilt is 25⁰ (similar to Earth’s 23⁰ axial tilt). 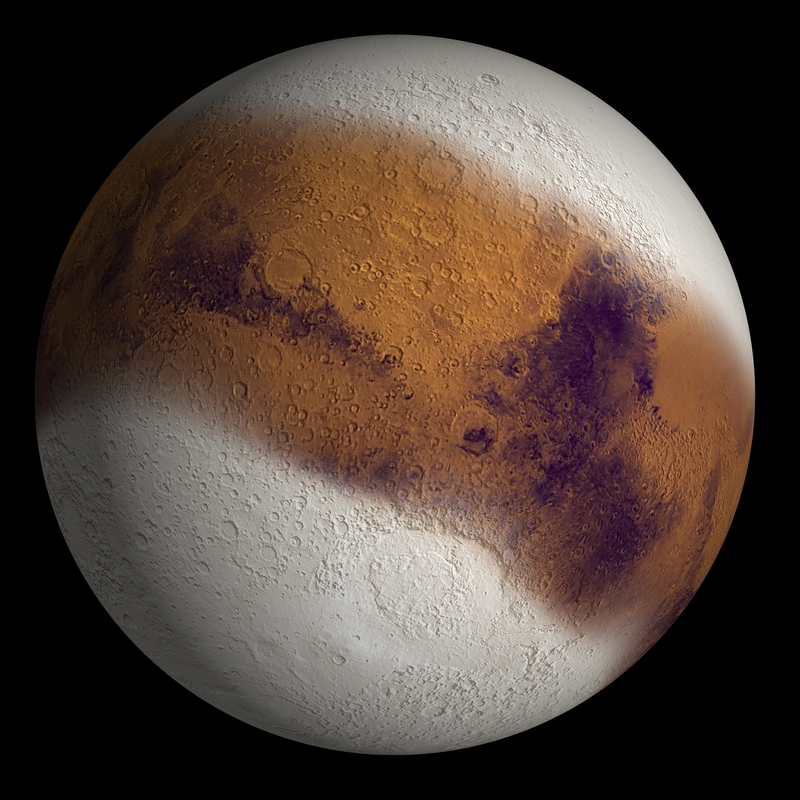 However, possibly because Mars lacks a large moon to stabilise its spin, there have been times when its spin axis was tipped over by up to 60⁰ – allowing the polar ice caps to spread, maybe even to the extent that there was abundant ice near the equator. Mars emerged from its most recent ice age about 400,000 years ago. Since then, its polar caps have been small, and any ice surviving near the equator has been buried under dust. The planet’s atmosphere is of low pressure and very dry. Although it is still possible for clouds to form at an altitude of several kilometres, until now it has been generally believed that any true snowfall would not reach the ground. The clouds, resembling Earth’s cirrus clouds, are believed to form when the small amount of water vapour in the atmosphere condenses (directly from vapour to ice) onto grains of dust lofted skywards during storms. Being only a few micrometres in size, ice particles falling from the clouds would would drop at about only a centimetre a second. This allows more than enough time for them to evaporate before reaching the ground (strictly speaking, the process should be called “sublimation”, because the ice goes directly to vapour, without melting first). Overnight and seasonal frost spotted on Mars have been explained by water-ice particles falling quickly because they had been made temporarily larger and heavier by an outer coating of frozen carbon dioxide from the atmosphere. The new study, published in Nature Geoscience, has found a way in which tiny specks of water-ice could travel down to the ground without this strange frozen carbon dioxide coat. If correct, this would mean genuine snow on Mars – just like that on Earth. The team used measurements from two orbiting spacecraft (the Mars Global Surveyor and Mars Reconnaissance Orbiter) to study how temperature varies with height in the martian atmosphere. They found that at night, the lower atmosphere below ice clouds can become unstable, because it becomes less dense below than above. This leads to rapid downdrafts of air, travelling at about 10 metres per second, which could carry ice crystals to the surface too quickly for them to “evaporate”. However, the snow layer would probably be thin and not last too long before it sublimes back into the atmosphere – where it could form new clouds and snowfall. The phenomenon is similar to what is known on Earth a “microburst”, when a localised 60mph (97km per hour) downdraft below a thunderstorm can be powerful enough to flatten trees. The same process can also be responsible for intense snowfall at a particular location, by carrying snowflakes groundward in a blast, punching through the near-surface layer of air that would normally be warm enough to melt them. 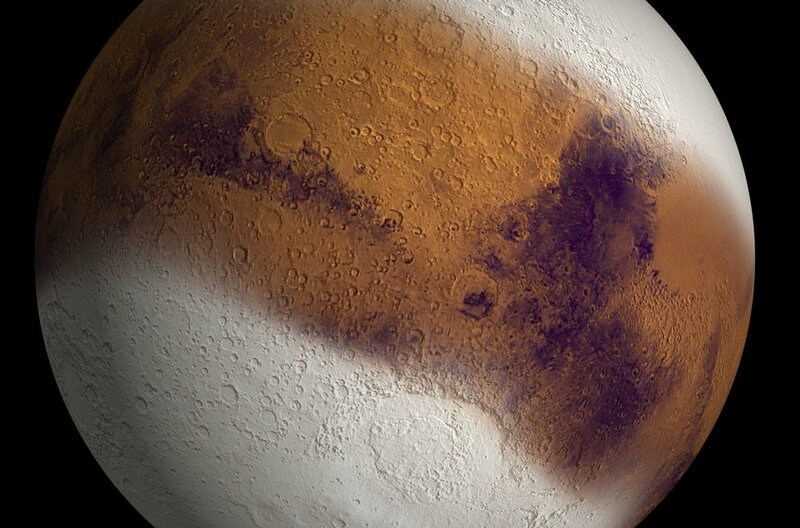 Snow has not yet been observed in the process of actually reaching the ground on Mars, but it has been seen falling through the sky. 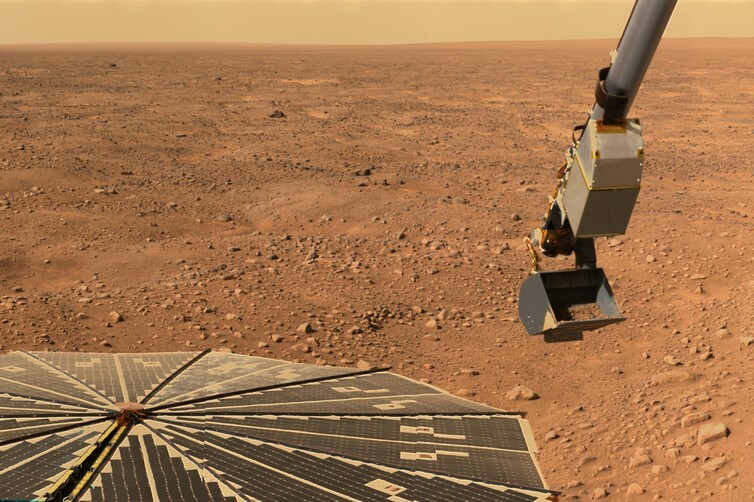 NASA’s Phoenix lander, which landed at 68⁰ N in 2008 and became famous for finding ice below the surface when it scraped the dirt away, studied the sky above too. It used a LIDAR (like radar but relying on reflections from a laser beam) to probe the atmosphere, and on at least two nights observed curtains of falling snow hanging below the cloud layer. If a downdraft powerful enough had occurred, then maybe one morning Phoenix would have woken up to a winter wonderland, instead of the usual red landscape – at least for a few hours.